20 Conductor (Brown, Red, Orange, Yellow, Green, Blue, Violet, Grey, White, Black, Brown, Red, Orange, Yellow, Green, Blue, Violet, Grey, White, Black) ribbon cable. Each wire is 26AWG, conductor stranding 7/34. Wire is silver plated copper. Pitch is 0.05". Rated 300V 200°C. 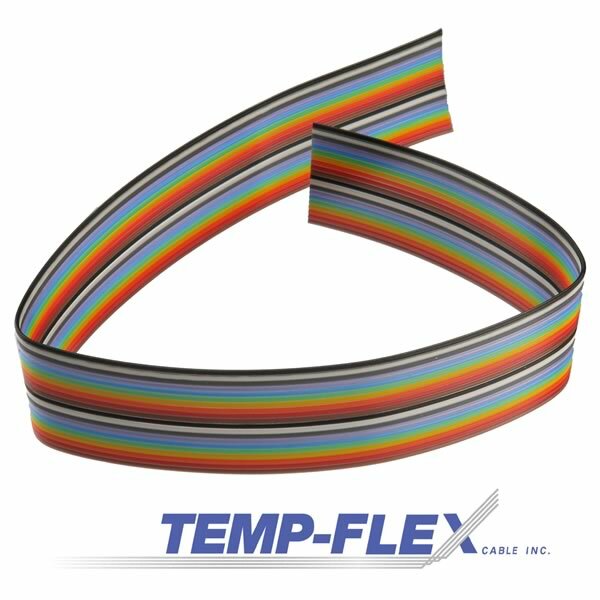 Temp-Flex Part# M49055/12-21. Sold per ft. (up to 10 feet continuous). Note: If you buy a quantity of 25 - you will receive (2) 10 foot lengths + (1) 5 foot length for a total of 25 feet.